9:00am Houseguests are woken up. LOLO – it’s frustrating.. you know.. we played really good games. LOLO mentions that Kandi and Dina aren’t really against Tom. Lo – It’ll happen when it happens..
Natalie says she’s felt that way for the last couple days. Lo says she’s always been by Nat’s side. Nat agrees says it was more the “awkwardness” of walking around the house while on the block. Natalie says Tom’s goal was to split up them three and it’s sucking they lost the HOH. Lo – or the veto.. I didn’t even play in the veto.. Lo – it would have been up against Ricky.. this is not an easy decision for the house. LO says that Tom told her he’s not going to backdoor her. Lo – I am going to have a conversation with him.. 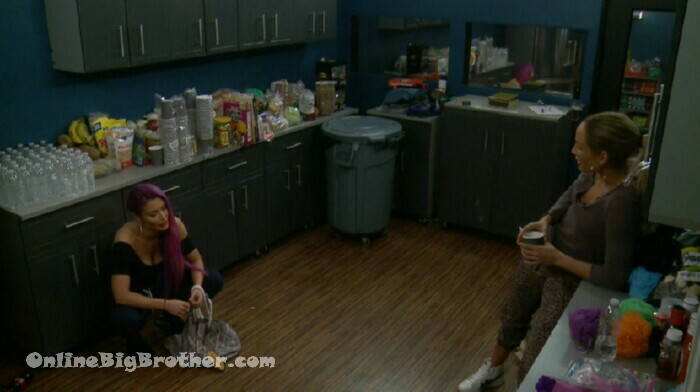 LO plans on talking to TOM asking why he told her he wasn’t putting her up and wasn’t backdooring her and did. 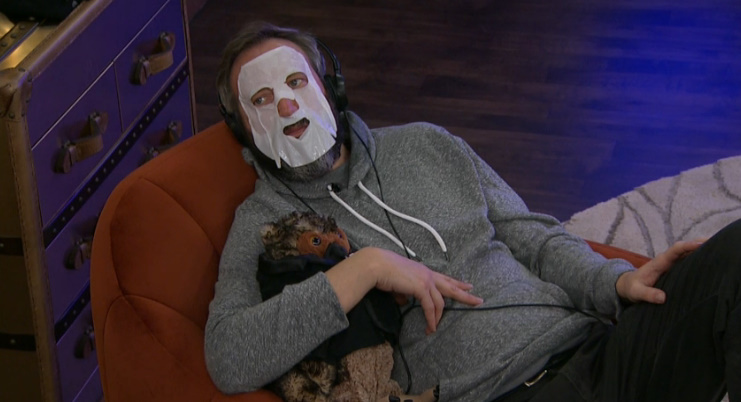 LO says it really hurt her the other day when her “personal stuff” was brought up ..
Ricky says this game helps you process disappointment..
Natalie – homeboy said I was safe.. (Tom) Then when we sat down at the table within 2-3 hours of our conversation and i’m up being able to like um… not not freak out.. WHAT! YOU SAID !!! N – Totally and not be so ….. the only person that I think I was kinda shunned I guess you can see mean mugged was Kandi.. I already told her.. I squashed it..
Ricky – I would have preferred it if you won it over me I felt confident in my chances.. I had a really good speech. R – the thing I love about games.. it’s not the winning or losing it’s awe inspiring how things change and move and they all lead to an end result..
Tamar – why do you feel bad fighting for yourself? Nat – They’re right there..
Tamar – not that you petitioned against her you’re asking do you have votes! Nat – it is.. I was going to give it to her. .I feel bad I have a husband i’m walking out to she doesn’t but then TA was like that’s not .. you shouldn’t that’s not no..
Nat – so then i’m like… that inner… ugh..
Nat – it’s one of those things I would rather know.. like we told JOE before.. so we’re not both sitting up there .. we already know what’s up that way it’s easier. nat – Tamar was like why should you take one for the team that’s not fair either.. SO … I dunno..
Dina – Breath.. you just gotta breath.. It just occurred to me that we have seen Lolo bat-sh*t crazy this entire time and she’s never even been on the block. Now that Tom saved Ricky and put Lolo on the block, could we actually see her insanity reach new heights?! It’s testosterone ragers she got . Poetic justice – Nat and Lolo wanted to keep Ricky safe this whole game, Fine! Tom will keep him safe too! LMAO!! I take it by the way everyone in the house has weirdly been protecting Ricky, that Ricky is the designated winner of BB 2. Well, I have to admit I have a hard time following what’s going on but at least it’s entertaining. I wasn’t expecting Tom to use it on Ricky. That threw me as well. I think Tom is making decisions based on what he thinks the viewer would find entertaining rather than what’s good for his chances at winning. It’s almost like he thought, well this’ll get folks talking; let’s do it! Expect the unexpected. I think that TOM is hoping to get a tv show. All the acting like a bird, dancing, etc. Go Tom! Didn’t think he would do something like this. Great game move. Does anyone know what changed his mind? He was so intent on getting rid of Ricky. 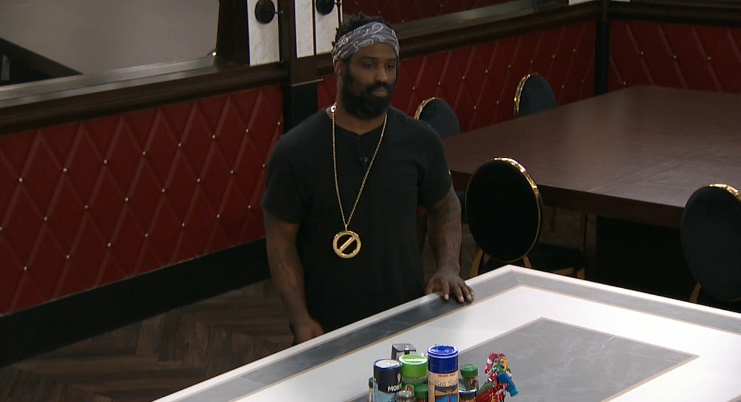 Well Ricky is taking credit for the move, telling tamar and Natalie he went to talk to Tom and was planting “seeds”, but i think tom came to the realization that he wasnt going to get the votes to get out Ricky. Was that for him or with him? Delusional. 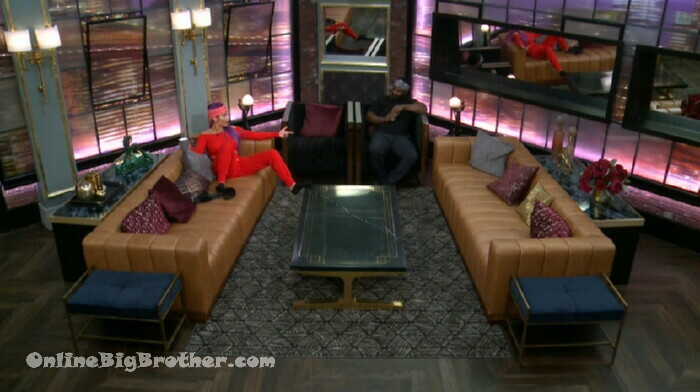 She saw the good in him as she hated him, said he was a bad mf’ing person, ignoring him, screaming at him, turnng on their alliance, talkIng about him non-stop for hours? Whatever. You just don’t get it. She’s been doing all that to build him up and shield him. Her actions have always, at the core, been to help Tom win this game. You just need to know the rules of the Locoverse and it all makes sense…with enough herbs and in the correct mind state. TOM! TOM!! TOM!!! I am flabbergasted!!! Now THAT is a move I did not expect him to make! He’s really using his remaining ball, LOL! I actually like this move bc I think it’s more important to break up Loco and Natalie and Natalie needs to go first, even though I can’t stand Loco. Now let’s please address Loco saying how she ALWAYS sees the best in Tom and is always standing up for him?!?!?!? BLAAAAHAHAHAHAHAHAHA!!!!! GIRL PLEASE!!!! And Tamar thinks America doesn’t like Tom????? Oh I can’t wait for that reality to hit her in the behind! Think about it, this move by Tom was SMART! He knew he couldn’t get the votes to vote out Ricky and he knew Ricky would still be here GUNNING for him, so turn it all upside down! SAVING Ricky gives Tom a better chance, even though he still has a huge uphill battle. HAHAHA those masks can get creepy.. I am disappointed that Tom used his veto on Ricky. That’s going to be his biggest regret! I don’t know; I”m beginning to think it’s 6-1 an half a dozen of another; Natalie or Ricky either one would be a good target. Ricky keeps saying he’s the strongest competitor in the house. I think Tom has proven that to be false. Breaking that power of three up is a good thing. Lolo is still an explosion waiting to happen. Ricky is petty. Never EVER thought I’d think this; but I’m hoping Kandi, Tamar and Tom make it somehow to the final 3. Not Dina because God bless her, she’s just a ditz. Don’t want Tamar to win. But for the sheer fact that she secretly wised up and discovered Kandi is a better bet than the Toxic Trio… I’d like to see her make it further than those three. That said, not one of those three would honor any deal with him anymore than they did when they were supposedly aligned. On the show tonight, Natalie made a big stinking deal over Kandi choosing her over Tom to compete against in the HOH; how dare she not be with them even though she’s been expendable from day one. And not one of them could beat the older dude with one testicle. I know; the fact that he jokes about it all the time makes it even funnier. He’s alot smarter than I assumed before BBC. Strange; but smart. Yes! He definitely regrets it. I loved the look of disappointment in Loco/ Nat/ and Ricky’s faces when Tom won HOH, lol ! On a side note, I saw an article in the paper today about the T-shirts Tom has been wearing on the show. They’re to support a friend’s business, that friend’s wife is dealing with cancer, so it’s to indirectly help with paying her medical bills. Favorite what??? That was funny when Kandi told her not the breathe fire. When Loco says, “This isn’t how an athlete should go out.” (shakes head in disbelief and coughs) Ryan. When Nem and Loco are discussing how to decide which one of them is leaving so they can tell the others how to vote (rolls eyes and says yiddish curse words to self) Nominees don’t get a vote. Did any of the others evicted this season get a head’s up or a choice? When Tamar says she would keep Lo, but she’s afraid they might get in another fight (purses lips, tilts head, side eye) shhhh, don’t give anyone a fringe benefit to keeping the whiny, delusionally self righteous professional victim. Nem is going to be one of Loco’s bridesmaids? Guess they need someone to wrestle this phantom groom to the ground in case he chews through the restraints. No, America would not be mad at you for getting rid of Loco because she’s an Olympian. You had no problem voting out Ryan. And he won medals. The voice of reason your paranoia tries to smother.